For us, organic is just the beginning. To make yogurt from real food and make it real good – we needed something exceptional. Luckily for us, one of our Sonoma neighbors was creating just what we needed. Located just 26 miles away, Diamond M Dairy provides us with single-herd Jersey cow’s milk. The farm guarantees animal welfare (Validus Certification) for each of their Jersey cows. This single herd roams the hills of Sonoma County year-round on land stewarded by a farmer who loves his work. Sonoma County is gorgeous with its rolling hills and dramatic sky. It’s a unique climate that features sunshine and fog from the Pacific. Sonoma County has also been home to farming families for generations. The Jersey herd roam among rye grasses, wildflowers, blackberries, and groves of bay trees and oak year-round enjoying tender green pastures and golden blonde grasses in summer. Curious by nature (and pretty darn cute), Jersey cows are a heritage breed known for its rich, full-fat milk. It’s smaller than the typical black-and-white dairy cows you see. Jerseys also produce a lot less milk than breeds used in industrial dairies. 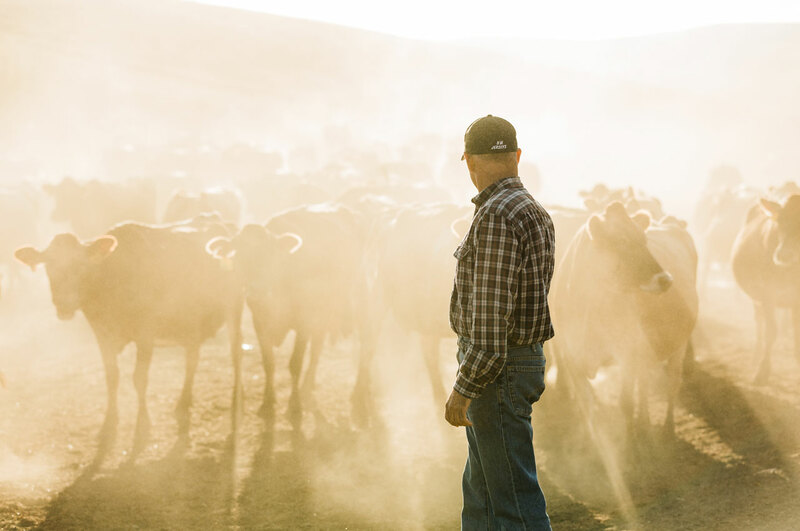 Instead of volume, Jersey cows yield quality raw materials for our yogurts and continue a farming tradition for families in Sonoma County.